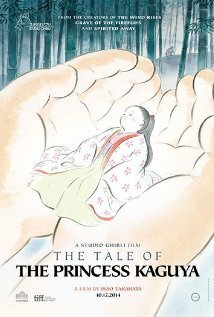 Summary: The Tale of Princess Kaguya is based on The Tale of the Bamboo Cutter in Japanese folklore. Okina is a bamboo cutter in ancient rural Japan. One day in the forest, he notices a glowing bamboo shoot that contains a tiny baby. He brings the baby girl home to his wife Ounaa and they decide to keep her and raise her as a princess, due to the magical way that she was found. From the time Okina brings her home he realizes she is not of this world. Okina finds more glowing bamboo shoots, which contain gold and robes. He feels that this is a sign that he needs to raise his new daughter in the best possible way, making sure that she grows up to be the finest princess. She is named Kaguya and she grows at an incredible rate, often becoming noticeably heavier while being carried. She quickly matures into an uncommonly beautiful young woman. Okina uses the gold he found to move his family to a mansion in the capital because he believes this is how a princess should live. 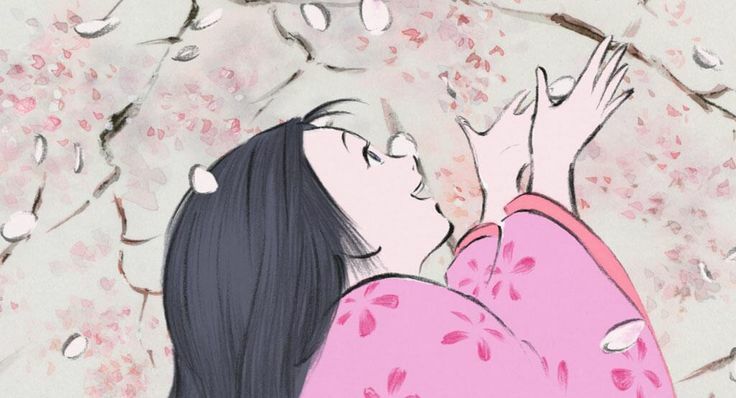 There is trouble from this point on, as princess Kaguya is wanted by all manner of royalty. Okina wants Kaguya to marry any of these royal suitors, but Kaguya does not feel the same way. There is reasoning for Kaguya’s lack of interest in these suitors, and we find out this reasoning in the climactic ending of the film. The Tale of Princess Kaguya is a beautiful and unique film that is animated using pastel and watercolor. It is breathtaking to watch the animation throughout the entire film. I watched the film in Japanese with English subtitles and I am so glad that I did. The voice acting was well done and fit the film perfectly. I keep thinking of how Okina’s voice would become uneven and crack when he was emotional. I knew that it was a quality film when the ending credits were rolling and I found myself staring at the screen, listening to the credit’s final song and thinking about everything that had happened in the film. The Tale of Princess Kaguya is directed by Isao Takahata, the same director as Grave of the Fireflies. I had a similar feeling after watching both of these films, a feeling that I had just seen an emotionally powerful film that I will remember for a long time. You might enjoy this if: You want to watch a beautiful and unique story that shows Japanese folklore. You might not like it if: You are expecting a more traditional Studio Ghibli fantasy film, such as Princess Mononoke or Howl’s Moving Castle. Note to the Viewer: I recommend watching the film in Japanese with subtitles due to the nature of it being a Japanese folktale. This entry was posted in Anime and tagged 2013, 2014, 33, anime, fantasy, folktale, fragglepuss, ghibli, hime, historical, japan, japanese, kaguya, monogatari, princess, review, studio. Bookmark the permalink.